Is a Fensa certificate a legal requirement for windows? Don’t miss our up to 40% off & 3 years no interest finance available only in our Spring sale! Planning on upgrading your windows any time soon? If so, there are a variety of ways to tell whether a double-glazing installer is properly equipped to do a sterling job, as well as being reliable and trustworthy. You may have already begun your research into local glazing installers and stumbled across the term ‘FENSA’, which has left you scratching your head as to what exactly it means. Don’t worry, you’re not alone! Sit back and relax and let us explain what FENSA is and why it’s important to acknowledge for replacement window projects. The Fenestration Self Assessment Scheme (abbreviated to FENSA) was initiated after the government launched the new Building Regulations for double-glazing companies back in 2002. Covering the replacement of external uPVC windows, doors, roof windows and roof lights in England and Wales, FENSA registered installers show homeowners that they meet the minimum standards of quality and compliance expected from today’s glazing industry. Windows that have been replaced since 1st April 2002 must be supported by a FENSA certificate or a building regs certificate, to show that they legally comply with Building Regulations. It is illegal to have installed double glazing in a property without a building regs certificate, and if proper building control procedures haven’t been followed, enforcement notices and prosecution may ensue. How long does it take to obtain a Fensa certificate? 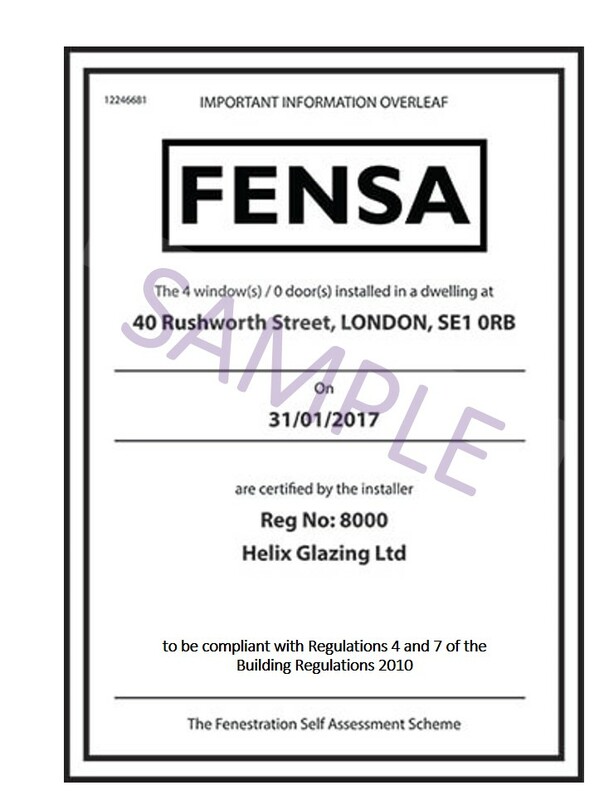 Fensa certificates usually take around 2-4 weeks to be issued, whereas non-Fensa registered double-glazing installers can take up to 2 months to get a certificate from your local authorities Building Control department. If you’ve had work done on your property and plan on selling in the future, it’s imperative that you keep relevant paperwork to disclose to potential buyers. As well as an Energy Performance Certificate (EPC), gas safety compliance certificate and electrical safety certificates, a FENSA certificate for glazed windows and doors should also be kept in a safe place and shown to potential buyers to prove that any building work is regulation compliant – especially homes situated in conservation areas. 1. You can apply to your local authority for a ‘Retrospective Building Regulation Compliance Certificate’. This route can take time and costs between £300 – £400. 2. You can take out double glazing building regulations indemnity insurance, as long as the work was completed more than a year ago. Typically ranging from £180 – £500, this type of insurance will protect against loss if your local authority enforces alternations or the removal of the double glazing. As acclaimed Fensa accredited installers (Certified FENSA Company Number: 11448), we’ve provided an unrivalled service for over 45 years. If there are any other glazing industry terms you’re not sure about, contact us today for an in-depth explanation and any other double-glazing related support you may require.